As I am trying to get back into the swing of things after having a great trip to Las Vegas this weekend I thought that I would share one of my favorite desserts that I had while I was there. Now I LOVE chocolate and this dessert definitley did not disappoint! 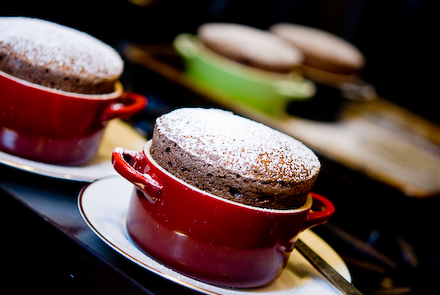 I had the most wonderful Chocolate souffle from Sirio Ristorante at Aria. It was absolutely sinful but you have to do that in Vegas right? Although this recipe is not from Sirio here is a great recipe to try from Zen Can Cook! Preheat the oven to 375 degrees F. Use a pastry brush (or your fingers!) to coat the inside of four 1 1/2-cup soufflé mold with softened butter. Fill the mold with granulated sugar, then pour out the excess. Pour the half-and-half into a saucepan and heat over medium high heat until bubbles begin to form around the edge of the pan. Remove from the heat and make a ganache by adding the chopped chocolate. Stir well until combined and all of the chocolate has melted. Make a double-boiler by setting a large mixing bowl over a pot of boiling water. Place the ganache in the mixing bowl, add the cocoa powder and water, and whisk until very hot. Remove from the heat and set aside. Place the egg whites in a large mixing bowl and whip on medium speed until foamy. Increase the mixer speed to medium-high and make a French meringue by adding the sugar 1 tablespoon at a time and whipping the whites to stiff but not dry peaks. Do not overwhip the egg whites! You can tell the egg whites are overwhipped if they start to separate and resemble scrambled eggs. Been there, done that. Use a rubber spatula to gently fold about half the meringue into the warm chocolate mixture. Then fold the chocolate mixture into the remaining meringue, being careful not to deflate the batter. The soufflé mixture should be homogeneous in color, but if you still see streaks of meringue in the batter, that’s okay. Use a large spoon to gently place the soufflé mixture in the buttered and sugared mold. Fill to about 1/4 inch below the rim of the mold. Run your thumb around the rim to remove the excess butter and sugar. Bake until the soufflé has risen to about 1 1/2 half-inch over the rim and starts to brown on top, about 12 minutes. Remove from the oven and dust the top with powdered sugar. Serve immediately with a side of Grand Marnier Creme anglaise.